This stunning Hotwheels Elite Batmobile was released in 2013 and features non-removable Batman and Robin figures seated inside. It is a 1:18 scale, is highly detailed / beautifully finished, and features opening doors and bonnet. 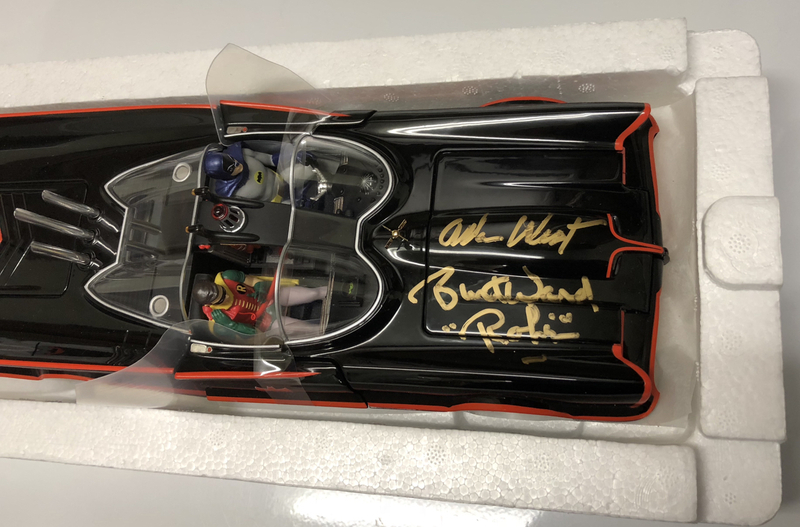 It is signed by hand by both Adam West and Burt Ward at their final Motor City Comic Con Appearance in Detroit, Michigan (in 2016). 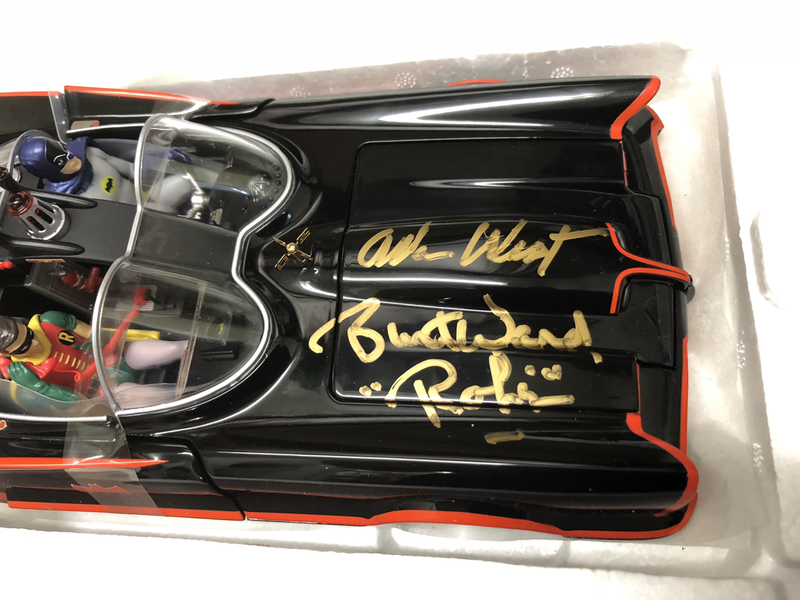 This Batmobile comes new and never displayed in its original packaging (of course, it has been opened to allow for the autographing but the box is still like-new). It will be shipped with the utmost care. 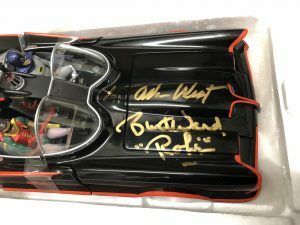 The first three photos are of the actual Batmobile you will receive. The last three are stock photos to show greater detail. 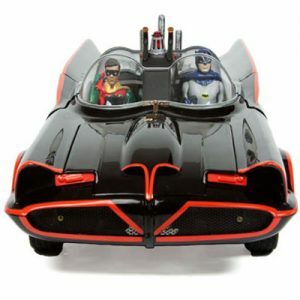 One of the biggest phenomenons in television history, the 1960’s Batman TV series influenced an entire generation of fans and possibly even helped save the Batman comics themselves from cancellation. 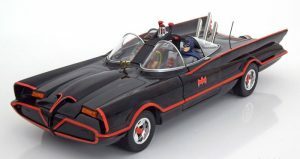 Debuting in 1966, it changed Batman from a reasonably successful DC comic character into a true global icon. 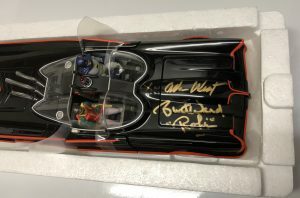 The series also created a merchandising bonanza exceeded only by Star Wars a decade later, turned the Batmobile into the most recognized fictional car of all time (surpassing all others contenders, before or since, including such icons as KITT, the General Lee, and James Bond’s Aston Martin DB5), and forever added it’s own catch phrases into the pop-culture lexicon- such as Robin’s famous “Holy…” whatever quips and “Same Bat-Time, same Bat-Channel.” In significant ways the TV series also made lasting contributions to the comic book continuity; the creation of Batgirl – a character specifically introduced into the comics for inclusion in the Television series – and, perhaps most importantly, returning to prominence the four classic villains of the Joker, Catwoman, the Riddler, and the Penguin (all of which were shelved for years due to the impact of Fredric Wertham’s anti-comics exposé Seduction of the Innocent).